In December 2011, I wrote in this blog about the original Witherspoon Building and the mystery surrounding its lost prophet statues (see the original post here ). The Presbyterian Church in the U.S.A. placed statues of ten prophets on the sixth floor of the building during its construction around 1896. When the church sold the building in the late 1960s, the statues were separated. The Philadelphia Memorial Park Cemetery in Frazer, Pennsylvania, bought eight of the prophet statues, but their whereabouts remain unknown. The Moses and Elijah statues were sold to Arthur Garrett, President of Community Utilities, Inc. in Skagway, Alaska, but their whereabouts were also left unknown. Through the magic of the Internet however, we now know where the Moses and Elijah statues are today. In April, I received an email message from Lloyd Silverstein, telling me he found two of the prophet statues. In his email, Mr. Silverstein said that he and his wife found some mysterious relics during an Alaska cruise in 2009. One of the cruise’s stops was Skagway, Alaska. During their stop, Mr. Silverstein and his wife toured the Skagway Museum and Archives. While wondering around the museum grounds, they stumbled upon relics and pieces of statues. The inscriptions on the bases read “Moses” and “Elijah.” The Skagway Museum staff knew only that a preacher had shipped them to Alaska from the east coast. Recently, Mr. Silverstein was browsing the Internet when he discovered the Society’s blog post on the forgotten prophet statues. The statues he found in Alaska and the ones depicted on the blog looked identical. Mr. Silverstein had found the remains of the Moses and Elijah statues! That was the good news. The bad news is that the statues now lie in disrepair. Mr. Silverstein was kind enough to send us his photographs of the statues and they show that the once beautiful statues are now in pieces. One photograph shows the middle torso of Moses with his breastplate. Another photograph contains part of the Ten Commandment tablets once held by Moses above the streets of Philadelphia. Under close inspection, one statue piece includes part of Elijah’s loincloth. We can hope that perhaps someday the two statues will be restored to their former glory. The Historical Society would like to thank Mr. Silverstein for his email and photographs and please remember we are always looking for more clues on the forgotten prophet statues. 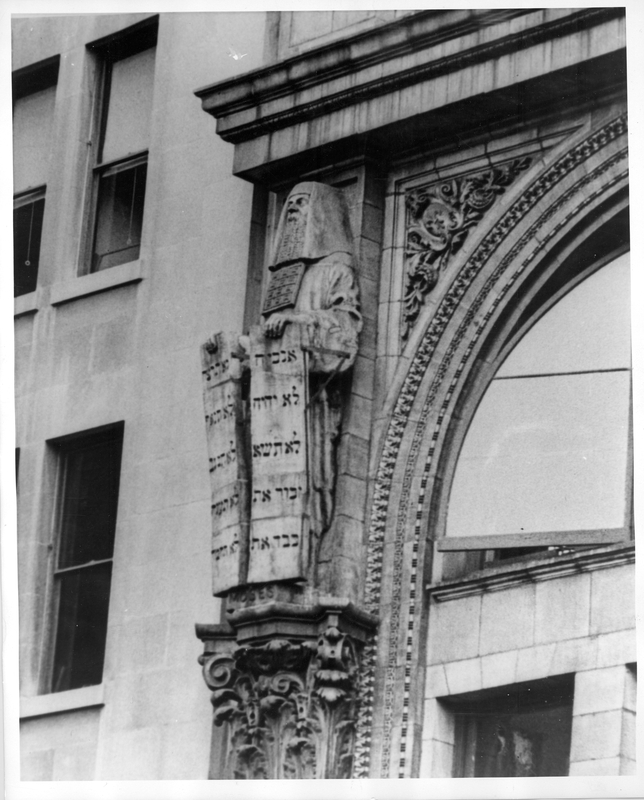 Statue of Moses as it originally stood on the Witherspoon Building (undated photograph, estimated at the early 20th century). 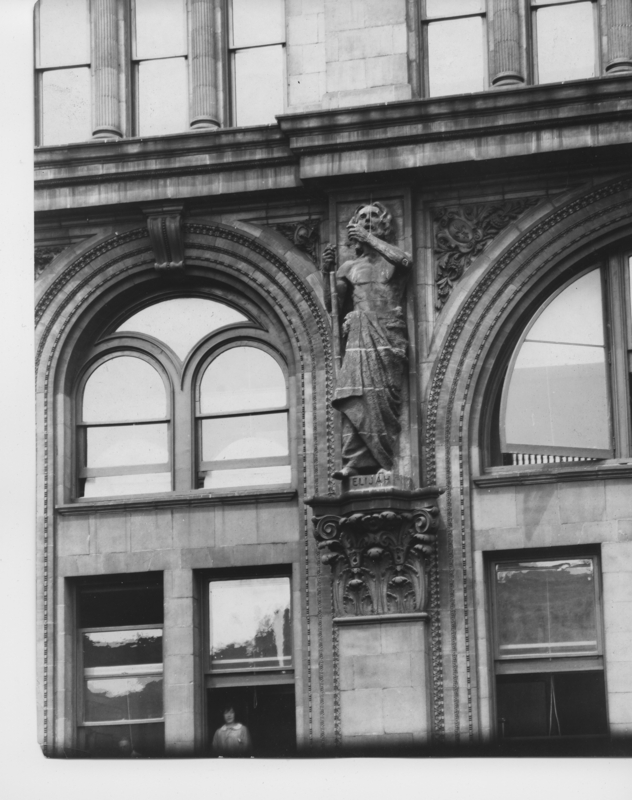 The Witherspoon Building's statue of Elijah as it originally stood.